Anyone who’s familiar with hard rock knows of Megadeth’s bassist, David Ellefson. David has been punching out intense bass tracks for years, and began sharing his wealth of guitar knowledge several years ago on his YouTube channel. 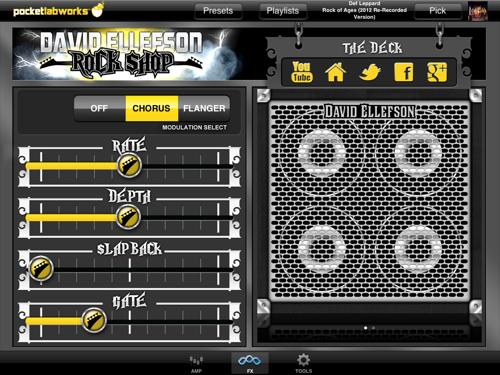 David recently kicked up his game a notch with Pocketlabworks’ Rock Shop App. 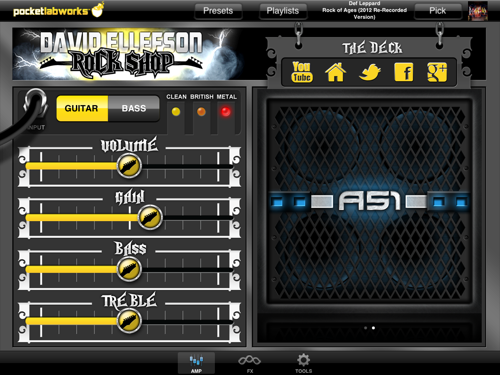 Rock Shop is a universal app that works with any iPad, iPhone (4 or 4s), or iPod Touch (4th gen or later) running iOS 4.3 or later. To use the app, you need to have a way to connect your guitar to your iOS device. Pocketlabworks, Inc. would like you to purchase their $99.99 iRiffPort adapter, which allows you to connect your guitar’s cable to a splitter that connects to the 30-pin port on your iOS device. I use IKMultimedia’s iRig adapter when connecting my guitar to my iPad. At $39.99, it’s an option for those for whom price is a bigger consideration. If you’re not connected to a guitar, the app repeatedly puts out pop-up ads for the iRiffPort. After the fifth time this happened, I got a bit annoyed with it. Thanks, Pocketlabworks, I got the hint. 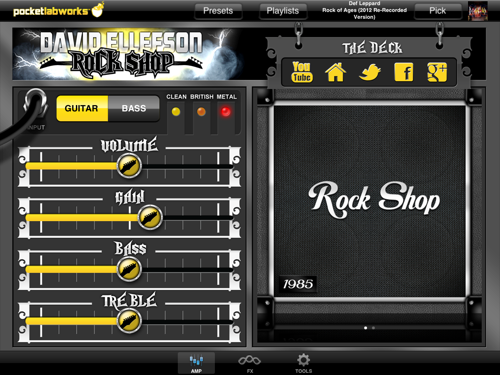 The main screen of Rock Shop allows you to select to play with either an electric guitar or a bass guitar. There are three presets for each guitar type. Clean, which plays like a traditional guitar; British, which sounds a bit like 60’s rock guitars in my opinion; and Metal, which sounds like Megadeth ought to. The presets sound pretty good, but if you like to tweak your settings, there are slider adjustments for volume, gain, bass, and treble. Being accustomed to using more controls with my amps, I’d like to see more control in the app, but for beginners this works just fine. The bass setting gives you slider controls for volume, bass, mid-range, and treble. You can also set it for “brite” or limiter sound, or a combination of both. The FX tab in Rock Shop takes you to several more adjustable sliders to change settings such as reverb, flanger, depth, and slapback. 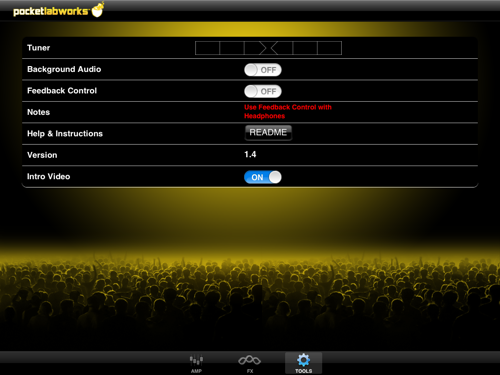 You can also adjust the noise gate, which is a useful feature. Again, you’re somewhat limited here, but it works well when you just want to sit down and rock out without thinking about a ton of settings. The tools tab features a built-in chromatic tuner for both regular electric guitars and bass guitars. You can also use feedback control when listening through headphones. Once you get a sound you like, you’re allowed to save an unlimited number of presets. That’s a nice feature, especially when so many different songs require slightly different amp settings. You can also play along with any song or playlist in your iTunes library, which I feel is a must with any iOS guitar connection app. 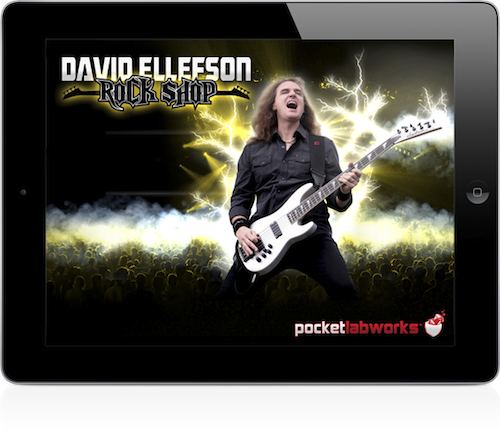 “The Deck” is an area of the app that connects you to David Ellefson’s YouTube channel, his homepage, Twitter feed, FaceBook page, and Google + page. If you’re into Megadeth and heavy metal music, this is a great place to explore. Overall, I’ve had a lot of fun playing guitar with Rock Shop. It’s an affordable option for anyone looking to sound like a heavy metal rock star without dropping a few thousand dollars in amps and equipment. Author’s Note: PcoketLabworks has told me that a fix for the popups is on the way. In the meantime, if you select “don’t show” on the popup and then kill or reboot the app, the popup will stop appearing. At any rate, it’s still a fun app, so rock on!